One of the advantages of tarvelling with an RV is that you’ll never know where you’ll end up next. You come to places where normally you can’t go due to some reasons. Such was the case with our coming to La Rochelle. We were on our way last year to Spain when we decided to stop here for a while, mainly because it was along the coast, and the place has facilities for mobile homes. But during our weeklong stay in the city, we have come to love it, so much so that we included it again this year (2015) in our route to the South. 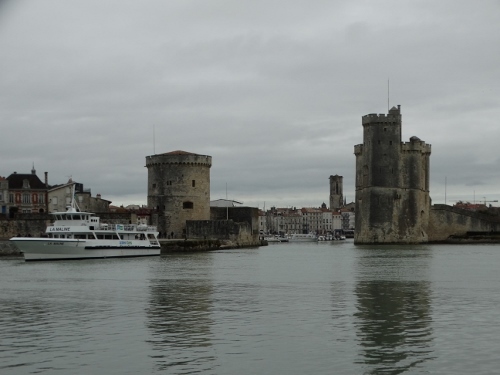 Coming back to la Rochelle is like almost coming home: we had the feeling of familiarity, easiness and safety the moment we arrived. 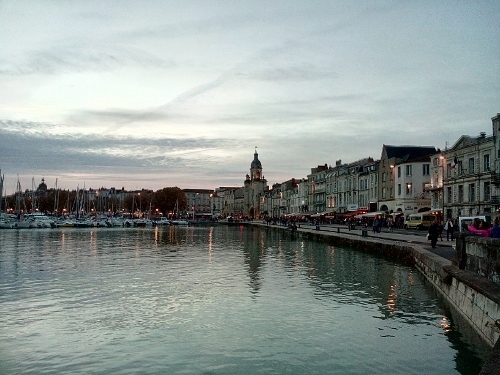 Coming from Saint Ceneri-le-Gerei, we drove about 350 kilometers to reach La Rochelle, beginning from 11.30 and ending at almost 18.00, just in time to witness a wonderful sunset, which sadly enough, we were not able to see last time because of the bad weather. The sight of that glorious sunset has set the mood for our second stay here…it promised better days, which proved to just so true! It is a big parking place with 31 free reserved parking spaces for campers. 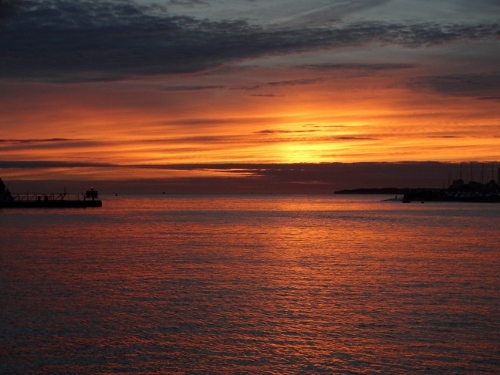 It is situated by the port, and the sea (the Atlantic Ocean) where you can see the sunset. It is about 3 kms from the city center. The parking was full, being weekend. 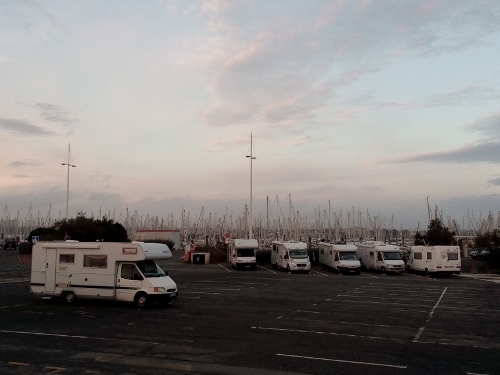 Some RVs were even parked at the big parking infront of the harbour. Internet could be accessed at 1 euro per day by the port. 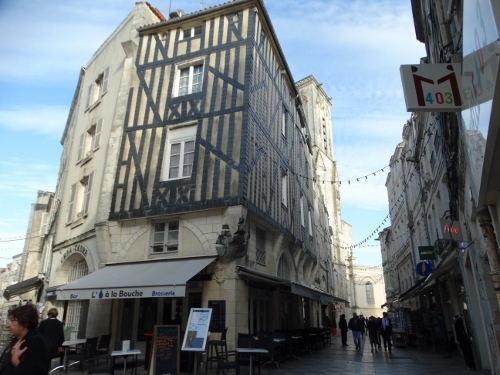 La Rochelle is a city in western France and lies at the Atlantic coast, flanked by islands of Re, Aix, and Oleron. There are boat trips tot hese islands departing from the city. From where we parked, we could reach the city in three ways : by bike, walking, or taking the bus boat fro 3 euro retour. From the tourist office, one can have a long walk around the city center, which begins along the small port going through the two towers, St. Nicholas and the Chain Tower. We took the first option, that by biking. In just less than 10 minutes, we were at the center. It was market day and we headed directly to the place. La Rochelle has a covered market which is open from 8-13.00, and on Wednesdays and Saturdays, there are also stalls outside. The market is a feast to the eyes! There are a huge variety of vegetables, fruits and fish; but the prices are almost double the price in Holland! We bought some mackerel, sardines , and some kind of fish which we were not familiar with. We also bought wild spinach and tomatoes. After that we drank some coffee at the nearby café. We were a bit shocked when we had to pay 6.40 for two cups of coffee! So expensive! We did a lot of walking. 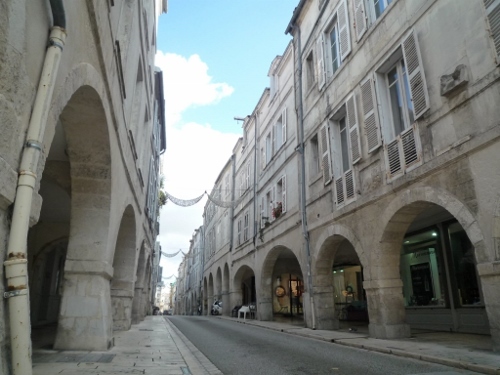 The buildings in La Rochelle are almost off-white in color, others are old and has dilapidated windows. The streets are small but clean. The most popular hang-outs of the local people and tourists alike is at the Vieux Port. Around this area are lively and cozy cafe’s and restaurants, and a charming promenade that will take one to the small harbour, the towers and the city beach and parks. What is also nice are the covered pathways in the city. One can still stroll/walk even if it is raining, or if the sun is shining too hot! There are also a lot of yellow bicycles for rent which can be useful in going around the city. Prices and cards are available at the Tourist Info office. 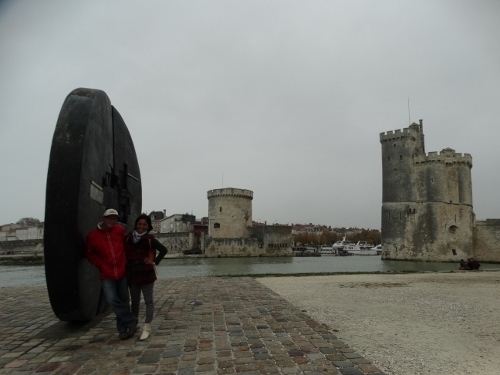 But I myself was uncertain and felt unsafe biking in La Rochelle. There are no clear biking lanes just like what we have in Holland. At some points, found myself biking side by side with some trucks cars; which I didn’t find good. But along the coast, there is a good biking lanes; one could relaxedly bike and at the same time enjoy the scenery of the surrounding, in this case, the parks and the sea. After our walks in the city, we bought some small cakes and drinks and just relaxed by the small port found just outside the city proper. We then headed back to the camper. On the way, there was a park with potable water, and we washed our fish there. We passed Passerella Nelson Mandela, a somewhat new bridge that takes one to as far as the opening of Bassin Lazaret and Bassin Marillac. From here one has also a very nice view of the city and of the ports. Port de Plaisance La Rochelle is such a big port with 63 pontoons. It is considered one of the world’s biggest ports, which can accommodate a total of 4500 sailboats. During the summer, there is a boat bus that sails from the port to the city center (retour is 3 euro) , but during the months of October till march, only in the weekends and special holidays. The port is near the Minimes beach, an oyster beach . The local folks do oysters/clams searching when it is low tide. We did just the same. An old man who was collecting at the shore at that time taught me how to do it last year. 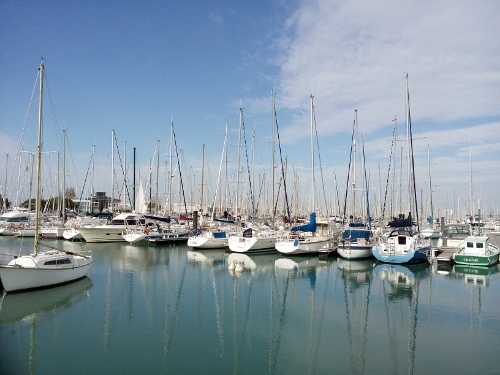 La Rochelle has three known beaches : Les Minimes beach (which is located at the Port La Rochelle and Parc des Peres), La Concurrence beach (located at the city center), and Chef de Baie beach ( located near the fishing port). 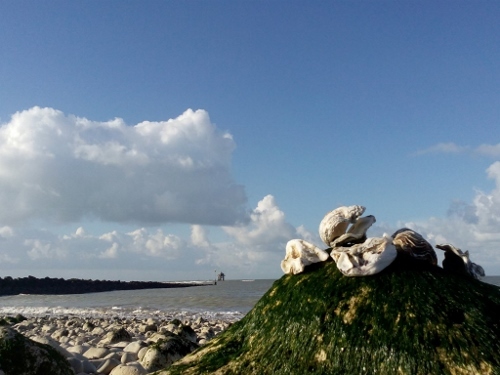 When it is low tide, Les Minimes beach changes into a big oyster beach. The sea water goes back as far as the Phare du Bout du Monde, a small very old house at least 300 meters away from the shore. The shore reveals a big oysterbed, where oysters are attached to stones and some kinds of seashells on the water and also on the stones. One can also see some small crabs crawling underneath if the stones are turned upside down. This time, we were more prepared with picking up oysters. We had our boots, a pail and a hark to remove the oysters from the stones. Hans and I spent two mornings just picking oysters and searching for some clams. We were alert for the low tide as we did not want to miss the chance for this activity. 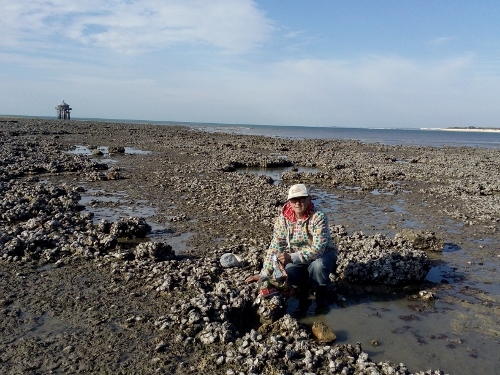 And being vacation time, the oyster beach was always busy with other oysterseekers! Lots of competition. But there was enough for everybody! We were becoming good with this that at both times, we harvested more than 20 pieces of oysters which we heartily devoured for lunch. That was heaven! Life is good! We also enjoyed taking long strolls along the boulevard, the beach (Plage des Minimes) and to the adjoining park (Parc des Peres). It is a beautiful park as one gets to stroll between the small trees and also have a wonderful views of the ocean. We biked all the way to the next village, Aytre and then back to the city center. And to top it all, we have witnessed a few wonderful sunsets in La Rochelle, which made our stay here even more memorable.